We are presenting a wide range of Lined Elbows, which is developed from the premium raw material. Our lined elbows are readily presented in different specifications as per the varied demands of the patrons. 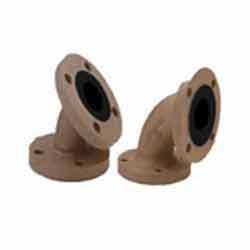 Easy to install, these dimensionally precise products are offered to clients at industry leading rates. VescoaT supplies and manufacturer of PTFE Lined bend and Elbow of various angles 90 , 45 and 60 , 30 on Request, We also manufactures in PFA / FEP / HDPE lined Elbow / Bend by using most advance and innovative techniques. Size: 25 NB TO 300 NB. Equal & Unequal Tees, Cross Tees, & Instrument Tees PTFE lined C.S spool pipes with one and fixed flange and other end loose. 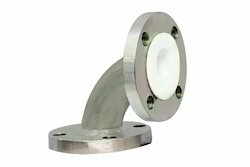 End Connection : Fixed Flanges. Size : 25 NB TO 300 NB.